The Special Collections Division of the Allen Library at the University of Washington, Seattle, has a small cache of Sylvia Plath and Ted Hughes materials. These are held in the Theodore Roethke papers. Theodore Roethke (1908-1963) met Sylvia Plath and Ted Hughes in London at a party in London on 1 February 1961. She wrote about meeting him to her mother the following day, saying "I find he is my influence" (Letters Home 407). Plath described him a bit, as well: "He's a big, blond, Swedish-looking man, much younger-seeming than his 52 years . . . Ted and I got on well with him and hope to see him again" (407). Plath's poems written at Yaddo were largely influenced by Roethke's "greenhouse poems" from his collection The Lost Son (Doubleday, 1948). Often Roethke's influence on Plath starts and stops with the likeness between her "Poem for a Birthday" sequence in The Colossus (Heinemann, 1960). However, perhaps Plath continued to receive inspiration from Roethke afterwards? 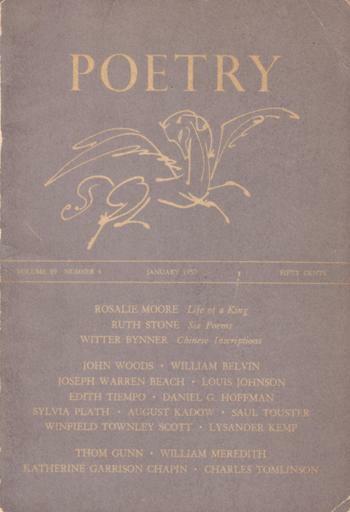 Did you know... Theodore Roethke's poem "The Far Field" appeared in the autumn 1962 Sewanee Review as well as the Times Literary Supplement issue on 21 December 1962. Those familiar with Plath will recognize the title of Roethke's poem as also being a line in the beautiful poem "Sheep in Fog." Plath started "Sheep in Fog" on 2 December 1962 when she was still very much in Devon and familiar with its "substanceless blue / Pour of tor and distances" ("Ariel", Ariel, 1965 36). Plath revised and finished "Sheep in Fog" over a month later on 28 January 1963. The time between start and finish saw Plath move to London, try to settle into her flat at 23 Fitzroy Road, and experience the publication of her novel The Bell Jar, among other things. 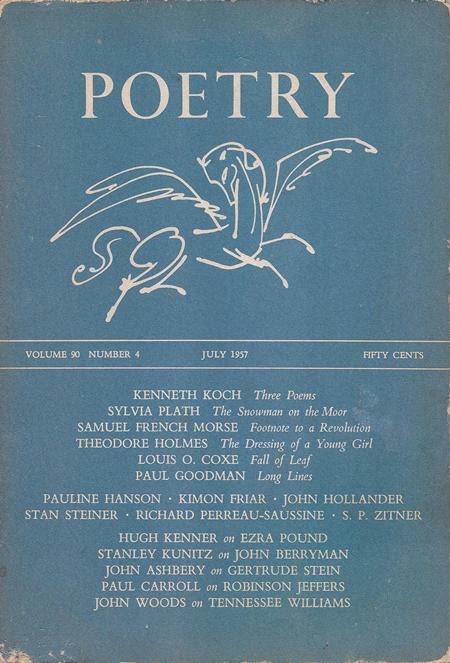 Plath, a Sewanee Review and TLS poet in her own right, may have seen Roethke's poem when it first appeared in the Autumn issue of the Sewanee Review. Speculation like this may be far-fetched, but could Plath have been referring to this poem by Roethke? Plath was preparing to leave Devon, and all that Autumn had been riding a horse and experiencing the tor's, distances, and far fields offered by Dartmoor. The Ted Hughes materials, in box 8, folder 4 of the Theodore Roethke papers, include two letters; two poems by Plath; and three poems by Hughes. Both letters can be dated roughly to December 1961. The first letter, typewritten, is from early in December 1961 and in it, Hughes discusses the practicalities of accepting - or rather turning down - a teaching position with Roethke at the University of Washington, saying that they need to establish a "tap-root" in Devon for about three years before they consider moving. The "tap-root" of course will immediately call to mind Plath's phenomenal poem "Elm" in which the speaking tree sympathetically declaims: "I know the bottom, she says. I know it with my great tap root" (Ariel 25). Hughes describes their house and property, and relates how tired of London both he and Plath were, saying that Plath is flourishing now and writing very well and that she listed Roethke as a reference for her recently submitted Guggenheim application. Hughes says he's enclosing one of Plath's newest poems and a couple of his. However, it appears he sent more: by Plath he sent "The Moon and the Yew Tree" and "The Surgeon at 2AM" and by himself "Pibroch," "Wodwo," and "The Burning of the Brothel." The second letter, handwritten, can be roughly dated to 27 December 1961. In this, Hughes refers to his previous note, saying that a teaching position is certainly not in the cards as they are just settling into a house, Plath's weeks away from producing a new child, so they are more or less "anchored" for a few years. Hughes asks Roethke to consider Peter Redgrove for the teaching position and describes Redgrove a bit. Now, for Plath. Plath was a great admirer Theodore Roethke and sometimes an imitator of his poetry. In box 11, folder 4 of the Theodore Roethke papers, there is a letter from Plath to Roethke and a typescript poem. The typed letter is dated 13 April 1961 and addresses him affectionately as "TR." The letter accompanied a book, the 1960 Heinemann edition of The Colossus, the exact coy of which is for sale (see more about this book in this search). Plath asks Roethke for forgiveness for the last sequence of seven poems ("Poem for a Birthday"), which she admitted were written under the influence of his own poems, and mentions that she is in negotiations with Knopf for an American issue that will not include some of the sequence. Plath asks Roethke if he would be a reference for a Guggenheim Fellowship for her, and asks (reminds) Roethke to have his publisher send her a copy of I Am Said the Lamb (a book of poems by Roethke published in 1961 by Doubleday; WorldCat). Plath closed the letter with handwritten postscript saying that she was enclosing "Tulips". This is the typescript poem that is included with this letter. Plath inscribed the top of the typescript simply saying that this was for Theodore Roethke from her. You can see more libraries that hold Plath materials on the Archival Materials page of my website for Sylvia Plath, A celebration, this is. I would like to thank the estimable and fantastic Dr. Amanda Golden for letting me know about the Roethke papers and Chery Kinnick and Carla Rickerson at the University of Washington for their assistance. As we enter the last week of Archives month in America and approach Sylvia Plath's birthday weekend (her birthday as you know is in two days, on 27 October), I thought a post about additional collections at the Lilly Library would be an appropriate way to celebrate her life and legacy. The Lilly Library at Indiana University is a well-established place of wonder. Sylvia Plath readers and scholars have made incredible use of the many Plath holdings there. The larger and more well known collections -- Plath mss; Plath mss II; Hughes, Ted mss; and Hughes, Ted mss II -- are really just the beginning as Plath can be found in a number of other collections and newer acquisitions. Did you know that the Plath mss goes all the up to IX (9) now? Here is a breakdown of Plath mss III through Plath mss IX. Some of the collections do not hold material created by Plath herself, but they relate to her. It should be evident which collections have original Plath material. And, of course, when in doubt, as the amazing Lilly staff. Plath mss. III, 1941-1951, consists of drawings, paintings, pastel works and college art projects by the poet Sylvia Plath, 1932-1963 (acquired 1988 ). Plath mss. IV, 1953-1966, consists mostly of letters and manuscripts of Plath and Hughes (acquired 1997). The collection holds four letters from Plath to Myron "Mike" Lotz (9 January, 13 June, 18 August 1953 and 20 May 1960); as well as eleven letters written by Plath and Hughes to their friends Kathy and Marvin Kane and one letter to "Elizabeth" [Sigmund, then Compton] discussing the Kane's visit to them written that same year. The collection includes other items among them including: correspondence between Hughes and Olive Higgins Prouty from 1960-1961 concerning Lupercal, and one letter from Aurelia Schober Plath to Prouty from 1966. The collection includes drafts of Plath's poems "Widow" and "Sow"; a set of instructions to the nanny "Frieda's Schedule"; as well as a photograph of Plath and two candid shots of Hughes. Plath mss. V, 1944–1945, consists of three items of early Sylvia Plath juvenilia (acquired 2009). I made mention of this collection here. Plath mss. VI, ca. 1963-1967, consists of early letters and ephemera of poet Sylvia Plath (acquired 2012). 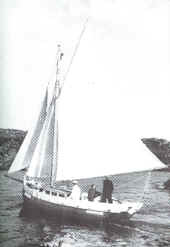 Included are original Plath letters to William Clair, poet and critic, former editor of the literary magazine Voyages. 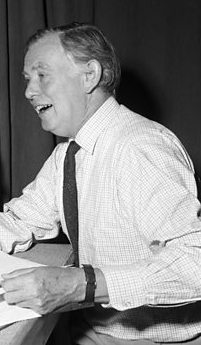 Other correspondents include Ted Hughes, Anne Sexton, Elizabeth Drew, Katherine Anne Porter, Alfred Young Fisher, Ann Williams, Peter Davison, Frank Murphy, and Ellen Stoianoff. Plath mss. VII, ca. 2012, consist of posters, schedules, handouts, programs and other ephemera related to the events surrounding the Sylvia Plath Symposium 2012 - The October Poems: the Archives and the Creative Process Seminar which was held on the IU Campus, October, 2012 (acquired 2012). Plath mss. VIII, ca. 1954, consists of the black and tan cloth suitcase of Sylvia Plath with the initials "S.P." of the front fore edge (acquired 1954). It is not possible that this suitcase was acquired by the Lilly Library in 1954, however that is likely when Plath herself got it. You can see a picture of the suitcase in this blog post from 31 October 2012. Plath mss. IX, ca. 1972-1978, consists of correspondence between Aurelia Plath and Olive Clifford Eaton (a neighbor in Winthrop, MA), Mary Alice Ericson (Olive Eaton's daughter), and Margery DeLerno (Olive Eaton's daughter) (acquired 2013). Sylvia Plath, as a named entry in Lilly's finding aids, appears in many other collections at the Lilly Library aside from the obvious ones in the Plath and Hughes mss series. I have posted previously on the Trevor Thomas mss; the Cleverdon mss; the Lameyer mss; the Sanazaro mss; the Wagner-Martin mss; and also the Oscar Williams mss. Plath-related materials can be found in the Antioch Review mss (see below) and the Kizer mss. 1. Reprint (2 pages) from THE ANTIOCH REVIEW OF Plath's poem, "Black Rook in Rainy Weather" (pp. 150-151). These are pages pulled out from an undated issue of the Review -- "1951-1960: The Second Decade." At end of Plath poem it notes poem originally appeared in vol. 17, no. 2 - summer 1957. 2. Photocopy of Contents page and pages 434-435 from -- DEAR EDITOR: A HISTORY OF POETRY IN LETTERS THE FIRST FIFTY YEARS, 1912-1962 edited and compiled by Joseph Parisi and Stephen Young, W.W. Norton, 2002. 3. A 2 page handwritten letter from Trevor Thomas to REVIEW editor Robert S. Fogarty dated 7/10/89 discussing Plath's work and submitting his copyrighted manuscript, SYLVIA PLATH: LAST ENCOUNTERS, for consideration to the journal. 1 page typescript letter dated Dec. 8, 1989 from Fogarty to Thomas thanking him for the submission, but stating "it is not for us." A copy (photocopy with paper covers in ring binder" of Thomas's SYLVIA PLATH: LAST ENCOUNTERS inscribed "To Robert S. Fogarty with compliments and good wishes - Trevor Thomas 7/10/89." Title page states "Published privately in Bedford, England, 1989." (ca. 40 pages). What is so wonderful about places like the Lilly Library, the Mortimer Rare Book Room, and other "houses of Plath" is that they are still actively acquiring collections, still processing collections, and still improving access to existing collections, which means that with every passing week, there is the prospect of new archival material being "discovered" and made available. If you are interested in Plath archival materials, it is worth your while to remember to periodically check for updates on each repository's website. All links accessed 18 October 2013. The Lilly Library holds the "Cleverdon mss II, 1926-1988". Within this collection (see the finding aid) are several Sylvia Plath related items. There are Sylvia Plath related items in the series "Writings by Others," Correspondence, BBC Registry, Program notes, and an audiotape containing "Lady Lazarus" and "Daddy" (see Box 7). In the Scripts subseries, there are transcripts of "Three Women" as broadcast on August 19, 1962, and the poem "Crossing the Water" with commentary by Ted Hughes as broadcast on July 5, 1971. In the correspondence series there are letters to or from Olwyn Hughes and Ted Hughes. Per an archivist at the Lilly, there are two letters from Olwyn Hughes, only one of which discusses Plath. The letter that discusses Plath is from 28 May 1971 and lists poems Ted Hughes prefers for Crossing the Water. The correspondence with Ted Hughes, however, does not mention Plath beyond Cleverdon himself telling Hughes to give Plath his regards. This obviously dates some of the letters to before 11 February 1963. I browsed through parts this collection during the Sylvia Plath Symposium last year and found Plath related material in boxes 7 and 8, and found many references to Plath. Some of the more interesting materials are lists of Plath's correspondence with BBC staff that includes small summaries of each letter's contents. This shows them taking stock of what they had at some point after Plath's life ended. It might have been these were retiring the letters from an active file to an inactive file, or preparing them for transfer to the Written Archives Centre. One does not necessarily know. The letters are all now held by the BBC Written Archives Center (and these were discussed in my paper with Gail Crowther, "These Ghostly Archives"). There are copies of internal communications regarding Plath's works from when she was living. Included among these are thoughts about "Three Women" from May 1962; production memorandums and other official BBC Radio documents regarding acceptance of the verse poem and payment for it; broadcast typescripts of the poem; audience research feedback regarding the airing of "Three Women" in August 1962 as well as its re-broadcast in August 1968; and notes by Cleverdon as he wrote his introduction to the poem (published in the limited edition version of "Three Women" from 1968 (see a cover image here) and in 1970's The Art of Sylvia Plath). Other interesting items I found in Cleverdon mss II include a typescript poem by Richard Murphy entitled "For Sylvia Plath / (1932-1963)". In eight, three-lined stanzas, Murphy's memorial poem remembers Plath's visit with Hughes in September 1962 to Coole Park, the Yew tree near where Murphy was born, the excursion on Murphy's boat, the Ave Maria, where he remembers Plath stood like a figurehead. But, now dead her words (truths) are created from a cemetery, while those still living stand around guiltily. Terrible paraphrase, but what can one do? The Cleverdon mss II papers include a transcript of the Peter Orr/British Council interview with Plath from 30 October 1962. 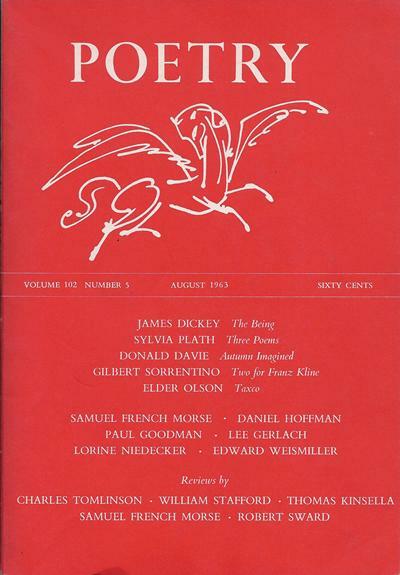 There are notes and memos about A. Alvarez's program on Plath that aired in the summer of 1963 (the text of which was printed in the October 1963 issue of The Review (see image of this cover here; and please note that the archives of The Review, which are held by the Rare Books and Special Collections at Northern Illinois University, were discussed by Gina Hodnik in "Early Public Representations of Sylvia Plath: An Analysis of the Sylvia Plath issue of The Review"). Sylvia Plath Collections: Wagner–Martin mss. The Wagner–Martin mss., ca. 1962–1991 at the Lilly Library of Indiana University, consist of the correspondence and papers of poet, biographer and English professor Linda Wagner–Martin. Included in the papers are research notes and materials, correspondence, interview notes, drafts of chapters, etc., relating to her biography of Sylvia Plath (Sylvia Plath: A Biography. New York: Simon and Schuster, 1987). 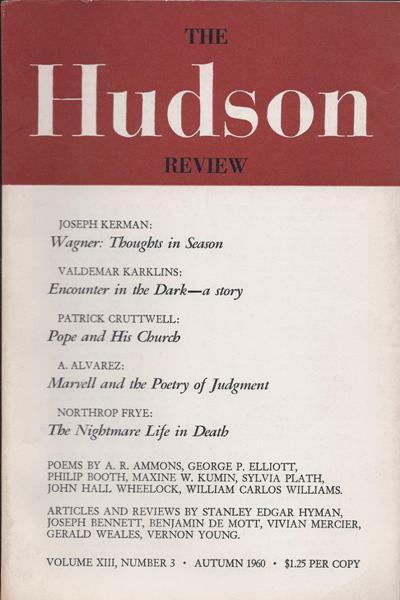 Other significant files include correspondence with Denise Levertov relative to a book Wagner edited for New Directions Paperbacks, but which was later withdrawn from distribution (Denise Levertov: In Her Own Province. New York: New Directions, 1979). Also present are correspondence files with Robert Creeley, James Laughlin, Joyce Carol Oates, Diane Wakoski, and Florence Williams (Mrs. William Carlos Williams). Wagner-Martin's papers include photocopies of three letters from Sylvia Plath to Daniel and Helga Huws from 30 October 1961 (4 pages), March 1962 (late winter, between 12 March and 31 March) (1 pages), and 26 December 1962 (4 pages). These are all long, good newsy letters - much too long to sufficiently paraphrase, but in short they detail the layout of Court Green, their life settling-in in North Tawton (which she found to be an ugly town), the birth of Nicholas, and her move to Fitzroy Road and dealing with the fallout and realities of life after Ted Hughes. They show Plath communicating with friends and exhibit her dry and sarcastic wit, her eye for detail, and to a degree, being a casual, living human, mother, person. Sometimes when reading Plath's poems and prose, I forget that there are other facets to her life other than the things for which she is primarily known. It is refreshing to see her being social, witty and humorous. Disclaimer: Aside from reading these great letters from Plath to the Huws', I have not worked with the Wagner-Martin collection. If someone reading this has, please leave a comment about it! I imagine there would be material in there, especially the research and interview notes, that might not have made it into the printed edition of the biography. In this way, the working papers of a biographer and critic are much like the working papers of a poet's poetry in draft. We pour over the worksheets of Plath's Ariel poems and those originated by Ted Hughes (and, naturally, other writers): to look for lost and deleted lines and imagery; to see how one poem relates to or was influenced by another; to see if a spark removed from one poem could often flare up into a poem of its own. These papers therefore might offer the raw reactions of the biographer, the subject, and acquaintances of the subject and yield nuggets of insight into Plath's life, times, and character. 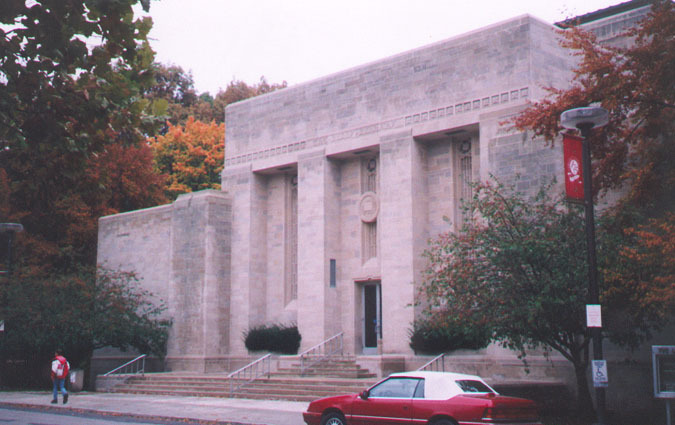 The Lilly Library at Indiana University holds the Sanazaro mss., ca. 1982-1989, which consists of correspondence and papers of poet and independent scholar Leonard R. Sanazaro, 1949-2004 (obituary), relating primarily to his interest in and work on Sylvia Plath. This is a great example of an archive that does not have Sylvia Plath-originated materials, but has materials about her. There is material in here that can help us understand how researchers conducted their queries before the "information age", which is so often now done sitting on the couch, wearing comfortable slippers, or something. They also hold items, such as audio files and transcripts of materials that otherwise might not ever see the light of day again. The 1980s perspective on Sylvia Plath is an interesting one to consider because it helped to guide us to where we are today. The collection is organized into the following series: I. Correspondence; II. Writings; III. Miscellaneous. The majority of the letters in the collection are from Sylvia Plath's mother, Aurelia Schober Plath, 1906-1994, with copies of Sanazaro's letters to Mrs. Plath being predominantly from 1983. Other correspondents in the collection are friends, and colleagues of Sanazaro relating to his career as a writer and biographer of poet Sylvia Plath. Dating primarily from 1983, these files revolve around his work The Dark Repose, Sylvia Plath: A Radio Biography which aired October 27, 1983 on radio station KUNR-FM in Reno, Nevada. The writings consist of a photocopy transcript of Sanazaro's Plath radio biography, edited by Aurelia Schober Plath, and a draft of his essay, The Paradox of Terrible Beauty: Unity in the Late Poems of Sylvia Plath. The miscellaneous files include receipts and memorabilia, lecture and reading announcements, and newspaper clippings. "Sylvia Plath and the Borestone Mountain Poetry Awards: 1955-1963." Notes on Contemporary Literature 11:4. September 1981: 2-3. "James Joyce, T. S. Eliot, and Sylvia Plath." Notes on Contemporary Literature 11:5. November 1981: 8-10. "On the Decline of the Oracle, 1955-57: William James and Sylvia Plath's Dryad Poems." Studia Mystica 5:1. Spring 1982: 59-70. "A Note on Ted Hughes' 'An Icon' and Sylvia Plath's 'Medallion'." Notes on Contemporary Literature 12:3. May 1982: 9-10. "Icons of the Apocalypse: The Poetry of Sylvia Plath and Edith Sitwell." Halcyon. 1983: 53-70. "Plath's 'Lady Lazarus'." The Explicator 41:3. Spring 1983: 54-57. "The Transfiguring Self: Sylvia Plath, a Reconsideration." Centennial Review 27:1. Winter 1983: 62-74. (Reprinted in Critical Essays on Sylvia Plath Edited by Linda W. Wagner[-Martin], 1984). Diane Middlebrook used this collection for her excellent book Her Husband: Hughes and Plath, a Marriage (Viking, 2003). One letter to which Middlebrook refers is from Aurelia Plath to Leonard Sanazaro and is dated 14 May 1982. The reference to this letter appears in Her Husband on page 175 (citation on page 323). Does anyone out there have a transcription of this letter? It appears to be missing from the collection. October is American Archives Month. October is also Plath's month. The month of her birth as well as for a month we remember for the wild creativity of October 1962. As such, this month will largely be devoted to highlighting Sylvia Plath archival materials that have previously not been discussed on this blog. Big archives like those held by Smith College, Indiana University, and Emory University will be referred to as they hold micro-collections of materials that include separately cataloged collections as well as collections within collections. Everything is connected and a visit to one archive, or the discovery of a new one, has a relationship to materials held in other archives. Some of the archives I consulted in the traditional fashion: visiting the temperature controlled reading room in a university library setting. However I think the majority were visited via cyber-space and through email requests...leaving the hunt to the good archivists and often being pleased with positive results. I prefer the former, the visit & the planning & the excitement of turning over a page myself and seeing Plath's handwriting, signature or typed return address. All the papers in all the archives are pieces of a puzzle that enables a researcher to reconstruct aspects and creations of Plath's life that are now separated. The archive forms the center of the Plath universe, being the remnants of the production of her life. The posts you will read highlight brand new archival finds (to me) as well as older archives that I have known about but never posted on (some posts I drafted as many as three or four years ago). They will also refer to previously mentioned collections for which more information was learned, and to archival materials that might be familiar to some but that may have largely gone unnoticed, under-utilized, etc. Currently I have in mind more than twelve posts, which I hope to post every Tuesday and Friday. So as to not totally inundate you all with information, this will extend beyond October and into November (every month is archive month!). When I discuss Plath's letters, paraphrasing will be used. This is not ideal, but it is the best option for now. And I should add, not surprisingly, that in the process of uncovering some of these documents they were located with Ted Hughes materials too. The documents I discuss are largely materials that might have gone into a next "These Ghostly Archives" paper, the series of archival conversations and stories of discovery, inquiry, and revelation which I have co-written with Gail Crowther between 2009-2013 (see this page of my website to read them). But as there are no plans for now to continue on with that series, it seems better to blog about the materials that have since been located. 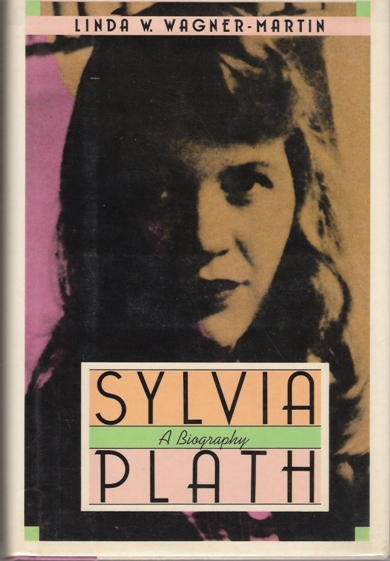 As I post each collection, I will be updating the list of Plath materials on the Archival Collections page of my website for Sylvia Plath, A celebration, this is.